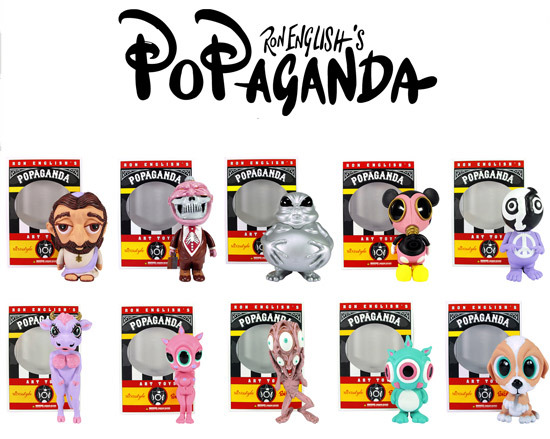 After quite a long wait, we are happy to announce that we now have MINDstyle's Ron English Popaganda mini figures in stock! They're window-boxed so you can choose whichever ones you want out of the 11 figures in the series. 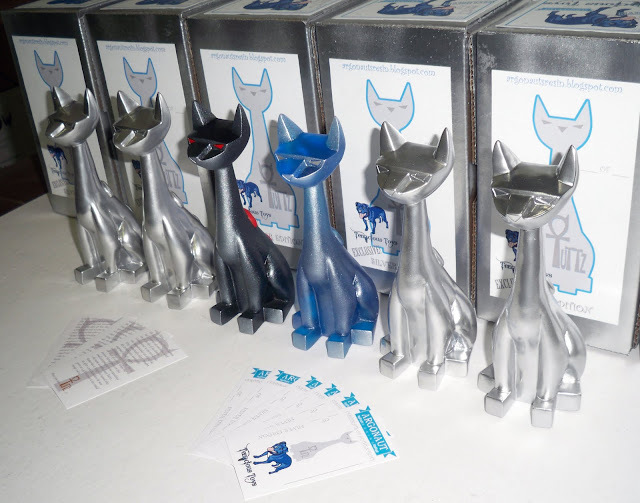 Price is $14.99 and you can buy them from us here. 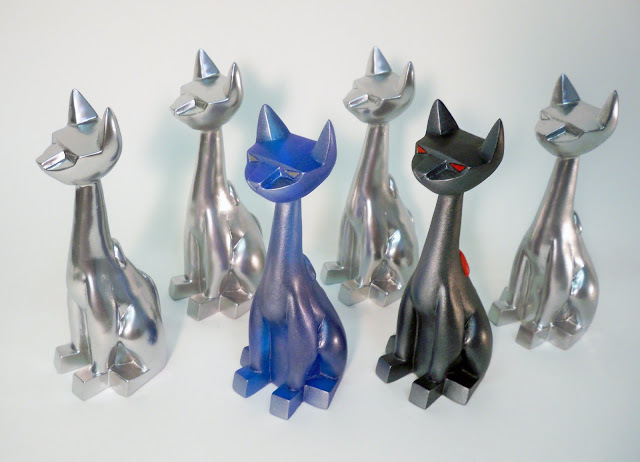 Behold: the final images of Wave 2 of our Exclusive Silver Tuttz figures from Argonaut Resin! We will be releasing them for sale this Sunday, September 19th at 9pm EST (that's 6pm West Coast time) in the Exclusives section of our website. Wave 2 consists of 6 blind-boxed Tuttz figures: 4 metallic Silver figures, one Blue Haze variant and one Cosmic Underworld variant. So no matter which one you get it's gonna be pretty darn cool, and EXTREMELY limited in nature. As with all Tuttzs, each figure is numbered and comes packed with a certificate of authenticity and a Tuttz story card. Price will be $55 plus shipping. One per person. Thank you, thank you THANK YOU to END for Argonaut for putting superhuman effort and lots of time into his Tuttz project, and for blessing our shop with the opportunity to secure an exclusive colorway. We are VERY grateful!! 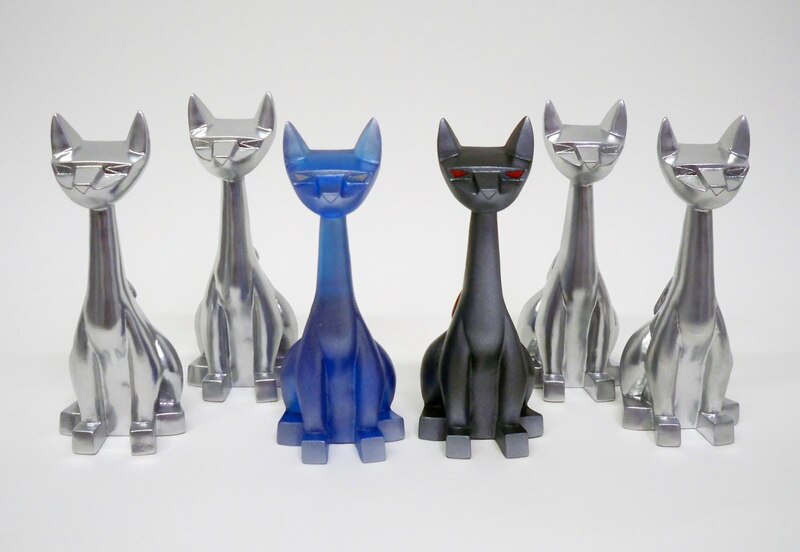 This is incredibly awesome and beautiful to me: mphlabs created a 4-figure set of Matt Siren's Ghost Girl figure colors that match those of the ghosts in the original Pac-Man game. 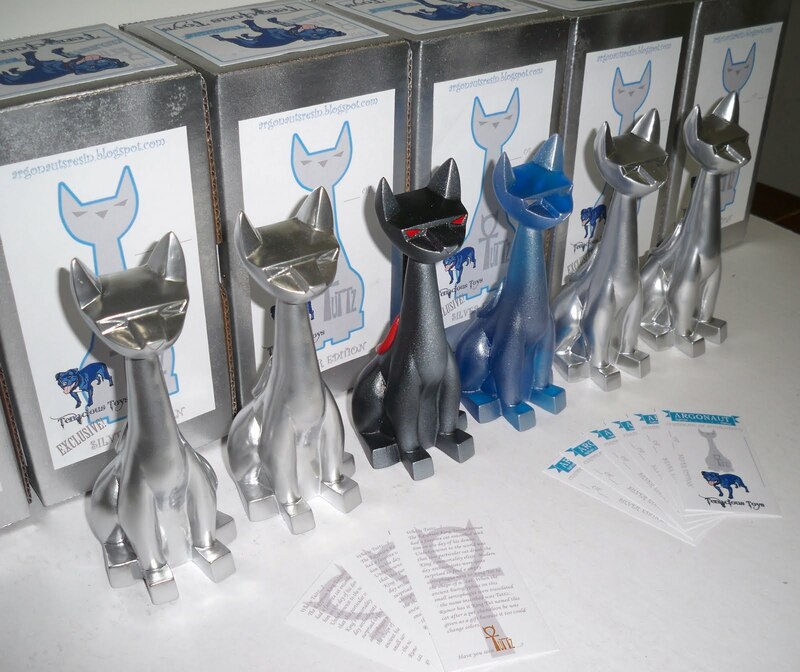 Price per figure is $50, and they are available separately. Please contact us via email if you want in on one or all of these, quantities are limited and we need to get an order in fast! 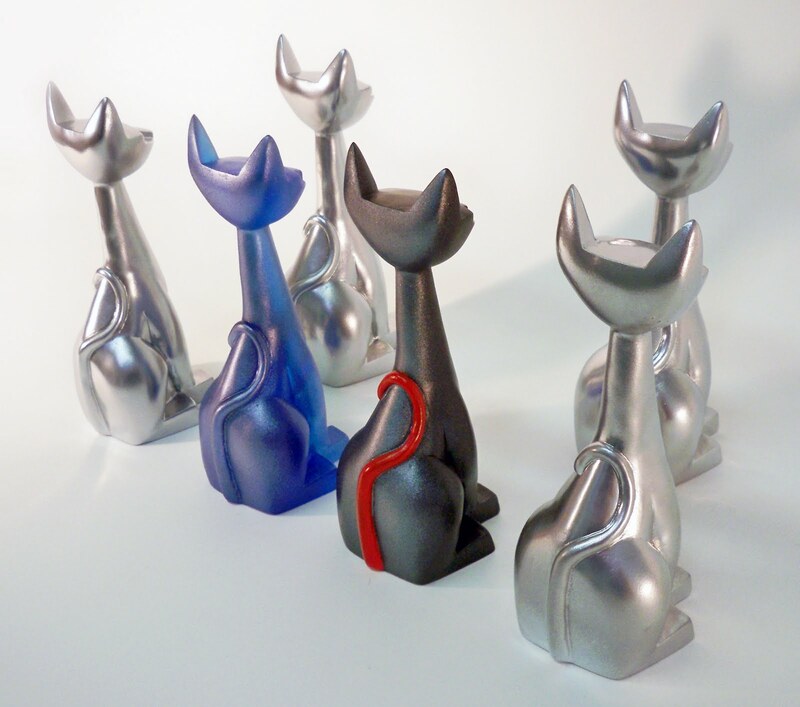 I could be biased, but I think Wave 2 of our Exclusive Silver Tuttz figures by Argonaut Resins could be the most beautiful collection of Tuttzs I've ever seen. These blind-boxed figures will be for sale this upcoming weekend at $55 each in our Exclusives section. 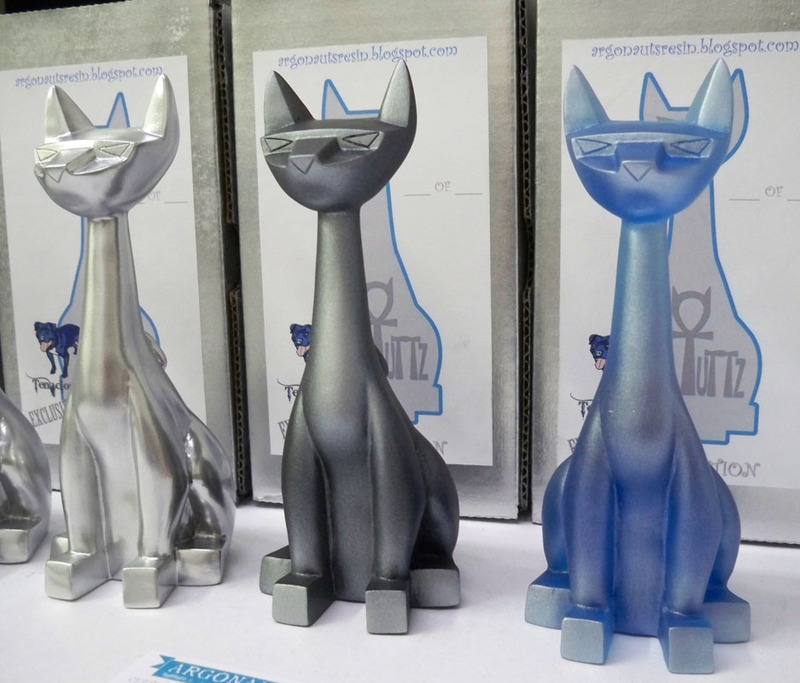 6 figures: 4 in our classic shiny silver colorway, 1 Cosmic Underworld variant (middle) and 1 Blue Haze variant (right). Will post exact date/time later this week, along with images of finished figures. Above image is a work-in-progress shot. I think my favorite seasonal toy offerings are those that come out just before Halloween... they usually involve either skeletons or pumpkins. 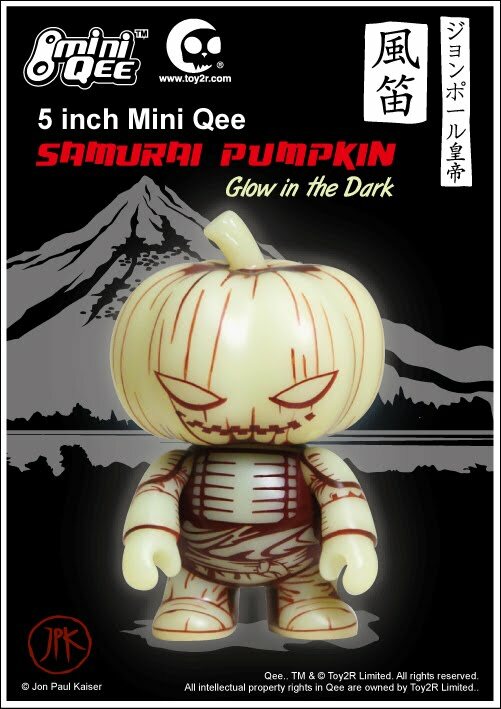 This one's a glowing pumpkin Samurai. I bet he could carve a mean jack-o-lantern! "The samurai code - loyalty, devotion and honor to the death." JonPaul Kaiser's Samurai Pumpkin comes out of the night with stealth and precision. Rarely seen and never heard - this warrior follows the same path. 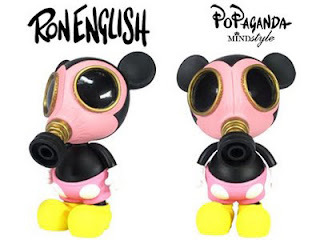 Toy2R is pleased to announce this very special and limited edition of the newly launched Mini Qee platform utilizing JonPaul's incredible design to create a warrior of unique character. Dropping next month, the Glow in the Dark edition will strike in time for Halloween - so be quick and beware - others may be seeking the same. Leecifer hails from Oaksterdam, CA. He likes spending time with his wife, drinking beer, playing video games and painting stuff. He once took a dump in the family pool and tried to blame it on their dog. Henceforth Lee was dubbed "Leecifer". 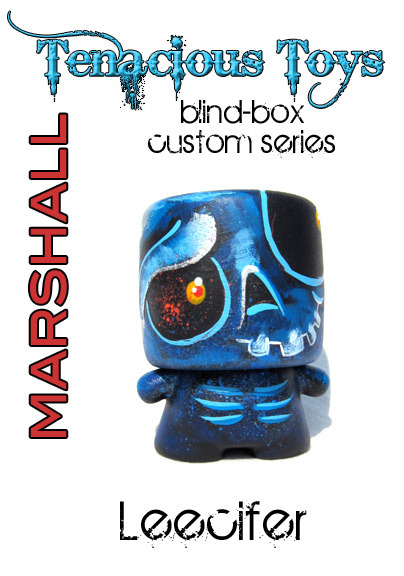 "In regards to just customizing - I use all kinds of paint and spray-paint, markers, pens, pencils, pastels, etc. I’ve hit up canvases, skate decks, walls, kicks/shoes, vehicles, all manner of wearables, door panels, toilet seats, furniture etc. I know I’m spacing on all kinds of stuff, but you get the idea. I tattooed for a while (I didn’t stick w/ it long enough to get very good) also then, I didn’t think you could make a good living at it (little did I know). I also spent almost 15 yrs as in-house design, illustration, and art direction for the phone company. 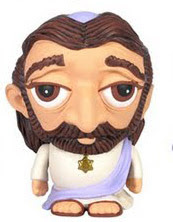 The job sucked horrendously, but I got to design giant inflatables, theme park styled costumes, set and stage design, vehicle graphics, all manner of collateral, stickers and posters, wearables for days, and stuffed animals of the corporate mascots and well tons of other stuff. I must say I miss the money, but love being able to do what I do now. On commission work - I love people who come outta’ the woodwork w/ killer piece of vinyl and a crazy idea they want to see realized. That’s collaboration baby!!! Or the people who see a bizarre piece of my art on a wall and just instinctively get it even if they interpret it in a manner I’ve not thought of. I am beyond pleased that it spoke to them as well! These are the souls that keep me eating and living indoors and keep me constantly challenged and working. It’s to these folks that I say - from the bottom of my heart, thank you very very much for all the commissions and gallery purchases. I am honored and can only hope, that even in some small way, my work can make you as happy as you make me!!" Leecifer contributed 4 Marshalls to our series: 3 like the one you see above, and one color variant. You can follow Leecifer on his website, Flickr, and Twitter. 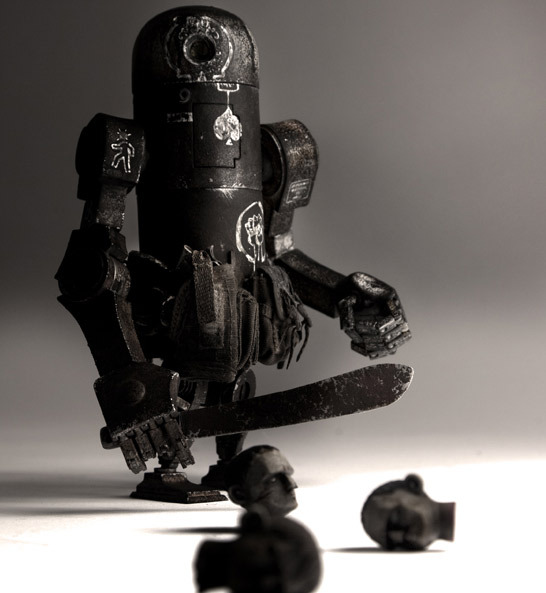 Turns out we have a couple of ThreeA's WWR Berties left in stock, after all this time! One Dirty Deeds (above) and one JEA Marine (below), for $45 each. 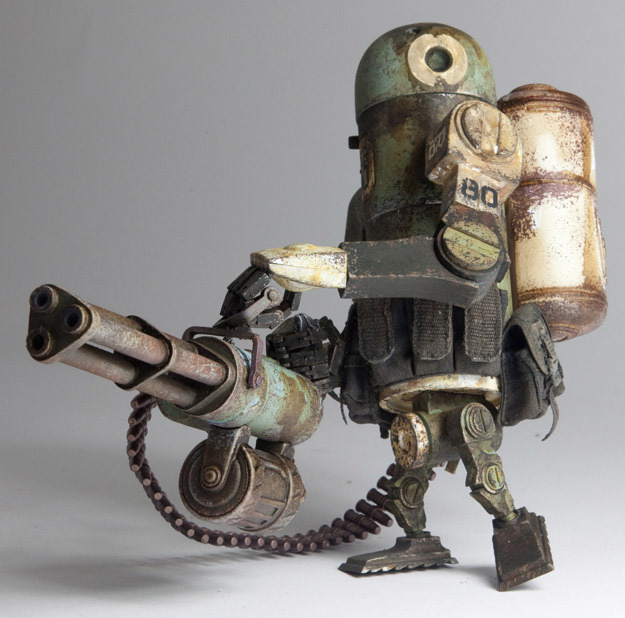 Find them in our ThreeA section. Don't sleep on this, they'll be sold before you blink your eyes. Especially since the going rate on eBay seems to be about $100. 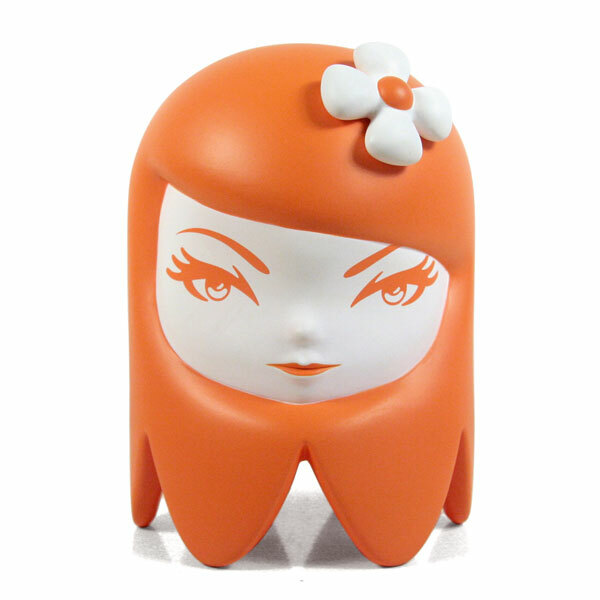 2PM- NEMO will be signing sketchbooks, toys and of course Art Hustle cards! We're going to have a NYCC Exclusive special foil-stamped Art Hustle card that does not normally appear in the regular packs, available ONLY at the Tenacious Toys booth! More info on that card soon. We'll also be showcasing a number of NEMO sculpts in our glass cases, and he will be bouncing back and forth between our booth and the Elite Gudz booth all weekend, so keep an eye out for him!